Why Should I Use Embroidery Underlay Stitching In My Embroidery Designs? Should Be Using In Your Embroidery Designs? As an embroidery business owner and digitizer myself, I was so confused and did not know how to get the answers to the questions that I needed! I attended several workshops at trade shows and spent many hours experimenting with different settings in my software before I finally was able to understand and grasp the concept of using Underlay Stitching. Until I fully understood how to use Embroidery Underlay Stitching and how to cope with the issues of Underlay Stitching, creating a single embroidery design to my satisfaction took many hours and was extremely stressful. Underlay Stitching is the most important and most under rated element of creating your design. Like anything else that is built, you need a good foundation and Underlay stitching is the foundation of your embroidery. Isn’t It Time For You To Learn How To Use The Right Underlay Stitching In Your Embroidery Designs So That You Can Create Crisp Clean Designs That Will Make Your Customers Want To Come Back For More? I help you the fundamentals of creating your designs! As a former owner of a profitable embroidery business I am now in the business of helping you start your own profitable embroidery business or help you set up systems to take your current embroidery business to a higher profit level. 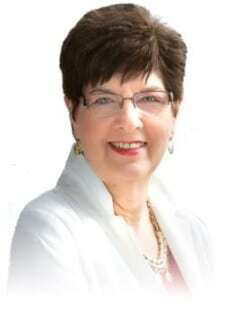 I’ve spent over a decade helping other embroiderers get started and increase their profits. Embroidery can be a very lucrative business when you have the right systems, approach and tools in place! You have your machine, you even know how to use it. You’ve started your business‚ but you’re having some problems with your basic design setups! They just do not have the crispness or the look of quality that is so important in trying to build your business and get repeat business!You know that you need to learn how to use embroidery underlay stitching but you really do not know where to begin! It can be so confusing with so many choices in your software! Do you know the 5 basic functions of Underlay Stitching? Do you know the 4 Basic Rules of Underlay Stitching? Do you know what type of Underlay stitching to use for each type of embroidery situation or fabric? Does your lettering sew out uneven or appear to be uneven? Do you know when to increase or decrease your underlay stitch length? Do you know how to increase or decrease or underlay density? Do you know when to use Automatic Underlay and when to use Manual Underlay? Learning to understand Embroidery Underlay Stitching is not hard. The methods that I teach and the illustrations and files that I share are simple and easy to follow so that all embroiderers, new and seasoned can understand and remember! 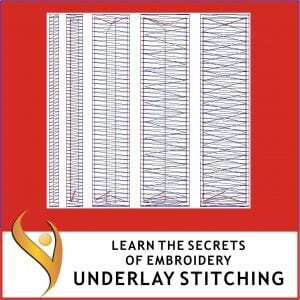 All of the above questions and many more are answered on our “Learn The Secrets Of How To Create And Apply Underlay Stitching To Your Embroidery Designs! ” Online Video Program that is available 24 hours a day, 7 days a week! Learning how to use Underlay Stitching in your embroidery designs is critical to the embroidery business owner that wants to produce the type of designs that really make them stand out above the crowd! You will discover why you need to use Underlay Stitching and what settings to use for your different situations, fabrics and design applications. Learning to understand the concept of Underlay Stitching will help you to create designs that will sew better, look better and make your whole life embroidery life a lot easier!!! What Is Included in this online training program? Design files to sew out so that you can see how adding the correct underlay stitching makes such a difference! Creating Manual Underlay when Automatic Underlay Does not work! Creating Manual Underlay under a Complex Fill object with holes! A small investment of only $197will provide you with all of the information needed to add Embroidery Underlay Stitching to your embroidery designs to produce the type of designs that you will be proud of that will bring in more repeat customers! Order Your Copy Of This Amazing “Learn The Secrets Of How To Create And Apply Embroidery Underlay Stitching To Your Embroidery Designs” On-line Training Program TODAY! Take Action Today To Have Immediate Access To The Embroidery Underlay Stitching On Line Training Program So You Can Start Creating Outstanding Embroidery Designs! P.S. Can you afford not to know how to create Underlay Stitching in your embroidery designs? Learn the Secrets of How to Create Underlay Stitching, even if you do not have digitizing software, to all of your embroidery designs and embroidery design setups! Click Here to learn these secrets! P.P.S. I want you to get started creating Underlay Stitching and adding it to your embroidery designs. That is why I’ve put so much time and effort into creating these videos and materials for you to work with. This is exactly what you need to help make your embroidery business stand out from the crowd! Click Here to Order Now!